If teams start thinking about test authoring and implementation with the end in mind, they can collect the value throughout the test cycle. This is the basis of RTDD. In the era of "X-driven development" trends like BDD, TDD, and ATDD, it is also important to realize the end goal of testing: the quality analysis phase. Test executions are not contextually broken. Therefore, they are too long to analyze and triage. Planning executions based on trends, experience, and insights is a challenge (for example, which tests are finding more bugs than the other?). Dealing with flaky tests is an ongoing pain, especially around mobile apps and platforms. A desire for on-demand quality dashboards that reflect the app quality per CI job, app build, functionality-tested area, etc. As an aim to address the above pains — which I'm sure are not the only related ones — I came to an understanding that if Agile and DevOps teams start thinking about their test authoring and implementation with the end in mind — that is, the test reports — then they can collect the value at the end of each test cycle as well as prior to and during the test planning phase. 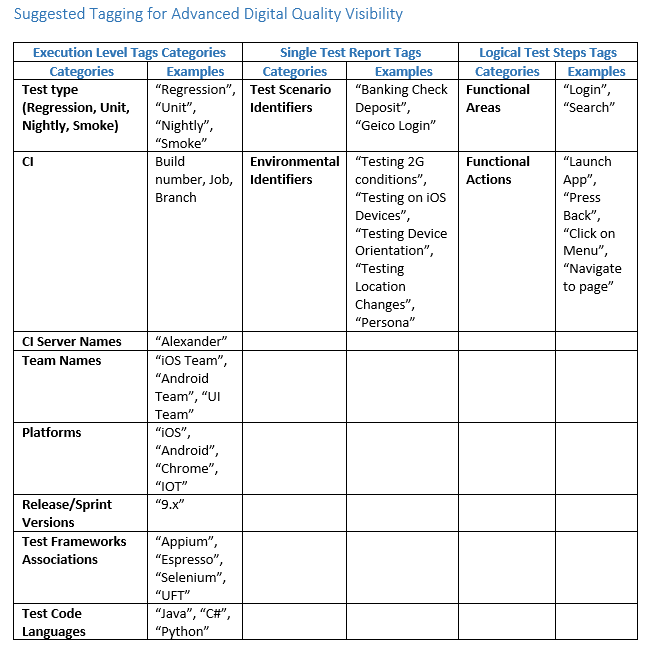 When teams can leverage a test design pattern that assigns their tests with custom Contextual Tags that wrap an entire test execution or a single test scenario with annotations like "regression," "login," "search," and so forth. Suddenly, the test suites are better-structured, are easily maintained, and can be either included or excluded and filtered through at the end of execution. In addition, when the entire suite is customized by tags and annotations, management teams can easily retrieve on-demand quality dashboards and be up-to-date with any given software iteration. Finally, developers that get the defect reports post-executions can easily filter and drill down into the root cause in an easier and more efficient manner. If you think about the above, the use of annotations as a method to manage test execution and filter them is not a new concept. 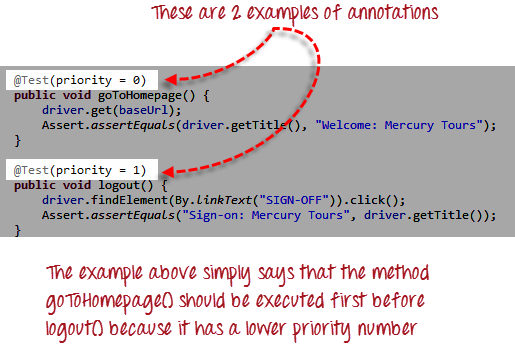 TestNG annotations with Selenium example. As seen above, there are supported ways to tag specific tests by their priority; it is just a matter of thinking about such tags from the beginning. Doing reverse engineering to a large test suite is painful, hard to justify, and most often, happens when it's already too late since the product by then is already out there and the teams are left to struggle with the four consequences mentioned above. RTDD is all about putting structure, governance, and advanced capabilities into your test automation factory. If we examine the following table that divides various tags by three levels. It can serve as a reference that can be immediately used either through built-in tagging and annotation coming from TestNG or other reporting solutions. This tag can encapsulate the entire build or CI JOB-related testing activities or it can differentiate the tests by the test framework in which you developed the scripts. That's the highest classification level of tags that you would use. This is where you start breaking your test factory according to more specific identifiers like your mobile environment, the high-level functionality under test, etc. These are the most granular test tags identifiers that you would want to define per each of your test logical steps to make it easy to filter upon, triage failures, and plan ongoing regressions based on code changes. As a reference implementation for an RTDD solution (in addition to the basic TestNG implementation that can be very powerful if being used correctly with its listeners, pre-defined tags and more), I would like to refer you to an open-source reporting SDK that enables you to do exactly what we're talking about. 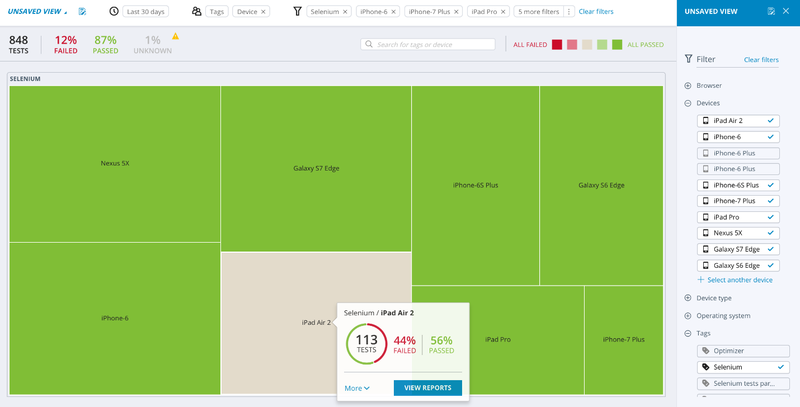 When using such SDK with your mobile or responsive web test suites, you achieve both the dashboards as seen below as well as a fast defect resolution that drills down by both test case and platform under test. Code sample: Using Geico RWD site with reporting TDD SDK. Digital dashboard example with predefined context tags. Better-structured test scenarios and test suites. Use tagging from early test authoring as a method for faster triaging and prioritizing fixes. Shift tag-based tests into planned test activities such as CI, regression, specific functional area testing, etc. Easily filter big test data and drill down into specific failures per test, per platform, per test result, or through groups. Eliminate flaky tests through high-quality visibility into failures. The result of the above is a facilitation of a methodological-based RTDD workflow that can be maintained much more easily than before. Happy testing (as always! ).